Whether backpacking or cycling around the world, the one thing that I would suggest is to never travel without a Swiss Army Knife. These versatile little bits of kit fit easily into a pocket, weigh next to nothing, and yet have a multitude of uses. There are a lot of cheap imitations around, but the genuine article is made by Victorinox, who offer a lifetime guarantee on the materials and workmanship. I have owned several of their knives, but alas, I am not the best at keeping them well oiled and in optimum working order, so from time to time, I need to buy a new one. I have a “gear I need to buy” list on my laptop, but as my next cycling expedition around the world is not due to begin for a year or two yet, I can pick and choose the best moments to buy each piece of kit. 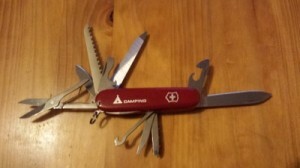 The moment to buy this Swiss Army Knife came when Tesco's were offering to double up their reward vouchers on certain departments, and one of those was camping. Due to the fact I had purchased my expedition bicycle on a Tesco credit card, and had earned reward points through that, I had 20 quids worth of vouchers. Doubling this up meant that I had 40 pounds to spend in the camping department, and so I bought this Swiss Army Knife and a few bits for the bike. Scissors – My toe nails are tough. REALLY tough! The Swiss Army Knife has a great pair of scissors that cut through them with no problems at all! Main Blade – When on the road, I use this for slicing cheese, peeling spuds, dicing carrots and more. Bottle Opener – Its pretty well known that I enjoy a beer! Corkscrew – Its also pretty well known that I enjoy a bottle of wine! Can Opener – This sees a lot of action, as I love eating tuna with pasta on my cycling trips. Wood Saw – Occasional use when there is a camp fire, although in some countries I carry a machete for this purpose and to clear a campsite for my tent. File – It doesn't get much use as a nail file, but occasionally sees actions as a metal file when things go wrong with the bike or other gear. Various screwdrivers – I carry a mutli-tool for the bike, but the Swiss Army Knife acts as a great back up. All in all, when it comes to value for money, and overall usage, it doesn't get much better than this. Never travel without a Swiss Army Knife! I just love to keep the Victorinox India Swiss army knife and other multi tools which could be perfectly used for everyday carry to outdoors.